Erin demonstrates the steps to create a no-sew zone in this video. She is working in demo mode. I use line pattern on this I Spy quilt for custom quilting. The emphasis here is to show how you can quickly change from one pattern to another using the pattern button. Notice the pattern button has a little symbol on it which shows it can be activated by a remote control. The OK button also has that symbol, so one button on the remote will activate OK, the other button on the remote will change the pattern. I do not have a remote control so just use the on screen buttons. I did mark-on-quilt the first two blocks so that I could size the patterns to fit. Having done that once, I didn't need to mark any other blocks because iQ remembers the size of the patterns once they have been used for line pattern. All the patterns used remain in iQ's memory until you exit back out to the main menu. At that point all the patterns are cleared from the line pattern memory. I chose to go corner to corner because that is easy to mark. I also didn't care which way up the patterns were because this quilt is not directional. If having the patterns all the same way up was important I would use the flip X or flip Y buttons on the line pattern page, changing each design before hitting OK. I found I could mark the inner border (half circle and loop) on one side, then 3 rows of the squares, then the inner border on the other side so they would stitch in one go. (see screen shot below) The patterns weren't very dense so the fabric draw up was almost non-existant. 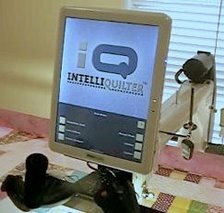 I did watch as iQ stitched just to be ready to scoot the fabric over a little if necessary. Here's a screenshot of the whole quilt. I did freehand stitching on either side of the seams in the pieced outer border so that doesn't show in the screenshot. iQ could have done that too. You can see the two blocks I marked in order to size the designs. You might notice how some of the rows appear to overlap slightly or have a larger gap between them - this is because I adjusted the quilt a tiny bit after advancing and realigning but didn't realign again after making the small adjustment. 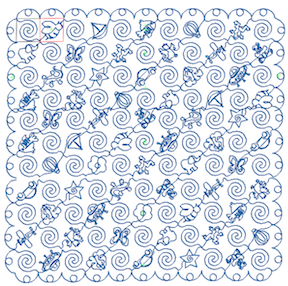 The overlapping didn't matter because I was using line pattern place the designs exactly where I wanted them.